Rick grew up on a farm in Southwest Michigan. The small town airport of Dowagiac was only a few miles away. A single, short, paved runway, an intersecting grass strip and a few hangars and ramshackle buildings made up the airstrip and FBO. The place I loved to ride my bike to was managed by a former WWII pilot by the name of Don LaPoint. Don flew B-24’s over Europe in the war and then returned home to run the airport and a small flight school. 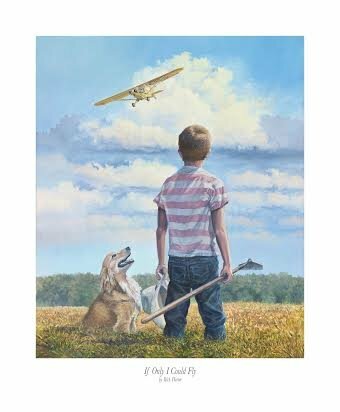 My very first airplane ride was purchased by my Mom and on my 13th birthday my feet finally slipped the fetters of earths gravity, for a ride with Don in a Cessna 150. 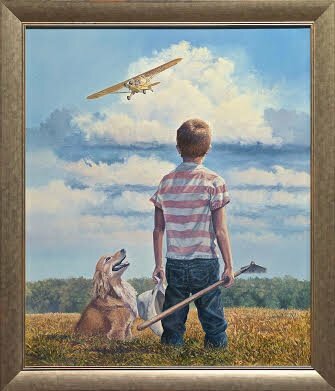 Because of the layout from the air and the distance from the airport, our farm was a navigational point and students would make a turn over the fields I worked in as a young boy. I spent many a moment gazing up through the hot sunshine of a summer day at Cessnas and Pipers as they flew over. The most vivid memory was of wishing that it was me up there and wanting to experience the adventure of flight. Little did I know that my artistic skills, yet developing at the time, would be the route to fulfilling that dream someday.